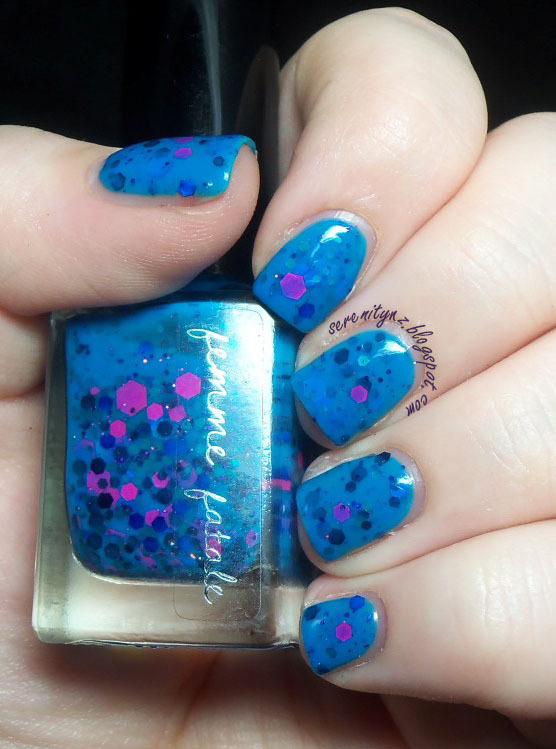 Aqueous is one of Femme Fatale's newest shades - its 'a medium bright blue crelly filled with teal, navy, blue, magenta and pink.glitters'. It should come as no surprise that I love this polish :) FFC can do no wrong! :P But seriously its so nice when you have high expectations from a brand and they consistently live up to them. The pictures show 3 coats of Aqueous with 1 coat of topcoat. Application was about what you would expect from this type of polish - a little thick due to the amount of glitter but nothing troublesome. 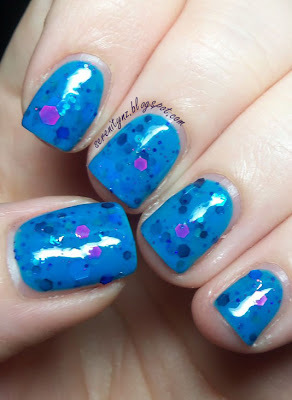 No fishing was required for the glitter either, which is always a bonus! Femme Fatale lacquers are available from their site for Australians, or Llarowe and Harlow & Co internationally. It seems to be sold out on both Llarowe and Harlow at the moment so make sure you keep an eye out on their facebook pages if you're trying to snag it! This one is great - so vibrant!